Prepare to be energized! NOMA is a dynamic, powerful vocalist and multi-instrumentalist with plenty of power and soul. Real life and Virtual stages are her home. An award- winning decorated veteran of the Second Life music scene, Noma Falta brings all that is her into the Life music world. Energetic, Bluesy and full of soulful performances whether full blown with her own tracks or just raw with guitar (or bass) and voice. A Professional musician and Vocalist loving the virtual platform to deliver music in Second LIFE. 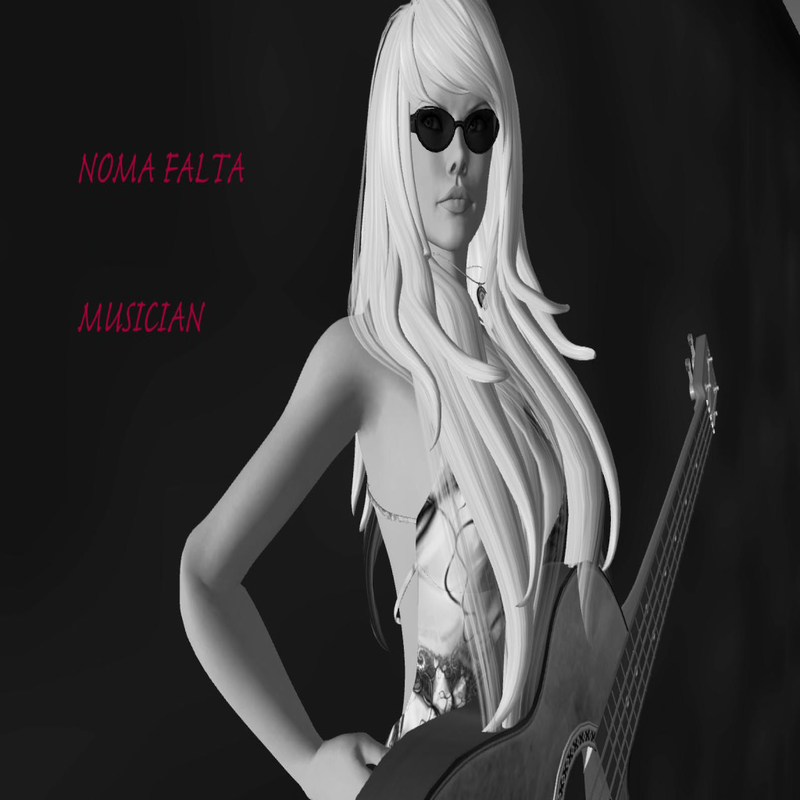 A diverse singer – Noma is known for powerful Rock, blues and soulful ballads. Noma has fronted bands in the U.S. and some overseas..
MUSIC is her Love and Life work. She brings over 4 decades of experience and musical knowledge into performing and interacting with audiences. From Symphony halls, Television, Bars, and large arenas…playing Live is where Noma belongs. Noma has many years of Real life experience making music live and in studios. Noma can be found on ustream and livestream and numubu. Just type Noma falta in search and find her. These shows are exclusive outside of SL and Rare. Facebook and twitter are ways to keep up as well wiht the comings and goings of Noma Falta. Noma has extensive REAL life studio work form the past and continues to do studio time as well in the present.This discography is a brief example. Shows are not to be recorded in any form audio or video. no youtubes posted of shows unless approved. I prefer to keep it all in sl as it should be. Some people do have my permissions to film and or record audio. NOMA plays Bass and sings Live for SL. Full band sound with tracks made in the studio by Noma and her guitar players and several other musicians as well as utilizing software instrumentation. I also play guitar and do solo acoustic shows as well..please specify if you prefer a laid back acoustic set. Vocals and Bass Guitar are live with tracks. These tracks represent the knowledge and depth of musicianship between Noma and her Guitar player(s) and friends in Real life. Painstakingly made for reallife performance ,in Duo work,before SL -and later brought into SL as a way to perform live with bass and sing and SHARE her love and lifework in music. Each track represents around 10-20 hours studio time. I perform Acoustic gigs -stripped down and unplugged like many artists in SL as well. I use Acoustic guitar, and sometimes bass, and voice only. I love the musical intimacy of SL and this is the most intimate it gets. I am available to Dual stream and perform with others in SL. I have done this with several musicians in SL and love the challenge it provides. If interested please IM me and let’s talk. On rare occasion I will perform live a REAL life Ustream /Livestream/numubu video broadcasts. I do accept Real LIFE studio work from SL..I have full digital capabilites and utilize Pro tools/ REAPER and other platforms in my own studio. Tracks are made for a fee comparable to Real Life market. due to instability of SL and LM’s being lost..it is a good idea of an exchange of emails in case of cancellations,etc.